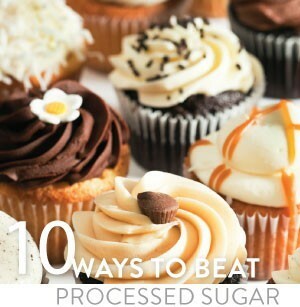 Eliminating sugar from a diet is the fastest way to improve overall health and lose fat. Of all the things that go into a body, sugar might be the worst because it has a tendency to sneak into foods. A recent study published in the Journal of the American Medical Association’s Internal Medicine found Americans consume nearly three times the recommended amount of sugar each day, which can lead to diabetes and an increased risk for cardiovascular disease. Weeding sugar out of a diet starts by understanding where it creeps in. Order sauces on the side to control the sugar intake of something like a honey mustard dip. A major culprit is tomato sauce where there can be 27 grams of sugar in 3 1⁄2 ounces. Opt for a less sugary pesto. Avoid ketchup, the cookout criminal, which has 3.7 grams of sugar per tablespoon. Instead reach for hot sauce or salsa, which is low calorie and contains vitamins. An unbalanced diet is another reason for craving high sugar foods. Bodies low on healthy carbohydrates suffer low energy levels because carbs are a primary fuel. Sugar becomes a quick fix during sluggish periods. Add complex, carbs like sweet potatoes to get back on track. If you aren’t logging the recommended eight to nine hours of shut-eye it can also lead to sugar cravings because your body senses low energy levels. Insulin sensitivity won’t be as high, which can mean increased body fat conversion from carbs. Skipping breakfast results in a mid-morning energy crash, leaving you susceptible to an easy cereal bar. Eat that and the ensuing insulin spike leads to another crash. Instead, grab a breakfast with a balanced mix of proteins, healthy fats and high-fiber carbohydrates. It would be unrealistic to never eat dessert again. It’s more about portion control. A serving of dessert should fill about half a cup. Satisfy cravings at home or the office with dark chocolate with at least 70 percent cocoa, which has more of the bean’s benefits. Think dumping Sweet ‘N Low into coffee slashes sugar? Think again. Studies show that Sweet ‘N Low’s sweetener, saccharin, and the aspartame found in Equal, cause greater weight gain than regular sugar by fostering cravings. Splenda is made from sucralose, a chlorinated artificial sweetener with harmful side effects like decreased red blood cells, male infertility, brain lesions and enlarged kidneys. Satisfy a craving for sweets with Stevia, a non-caloric herb. It is several hundred times sweeter than regular sugar, meaning it also takes less to get the job done. Checking a package’s ingredients for sugar or high-fructose corn syrup is a no brainer. But it also hides behind other names like dextrose, barley malt, sorbitol, ethyl maltol, fruit juice concentrate, caramel, lactose, maltodextrin and turbinado. Drinking water helps metabolize foods. Hunger and thirst cravings are controlled by the same part of the brain, so a grumbly stomach might really be a call for water. Men should aim for 3 liters per day, 2.2 liters for women. If you get a food craving, try this: Drink a large glass of ice cold water and wait 10 minutes. If the craving lingers, snack on a fruit. Manufacturers often infuse sugar into children’s snacks. Be leery of the “made with real fruit” labels because often the snack is laced with sugar and artificial ingredients. A General Mills chewy fruit snack can contain 10 grams of sugar in one pouch. The artificial colors that go along for the ride, like Yellow No. 5, can cause hyperactivity. While real fruit isn’t always practical, a smarter choice is Annie’s Homegrown Bunny Fruit Snacks, which still contain sugar but rely on organic black carrots for color. Everyone knows the main “bad guys” out there—soda, sweetened ice tea, sugary coffee drinks, candy bars and cake. Less obvious are the ones marketed as health food. According to The American Heart Association, men can consume as much as 37.5 grams of refined sugar per day (about 9 teaspoons) and women can take in about 25 grams (6 teaspoons) as part of a healthy diet. A banana nut bread-flavored Clif Bar contains 22 grams of sugar—the same amount found in a chocolate coconut cake doughnut from Dunkin’ Donuts.